Bruce Davenport Jr. grew up in the Lafitte housing projects in the Sixth Ward neighborhood of New Orleans, LA. Davenport Jr. participated in marching bands throughout junior high and high school where he found a creative community that has inspired his artistic practice. His drawings capture not only the vibrancy of marching band culture, but also their role as beacons of collaborative community for many young people in New Orleans. 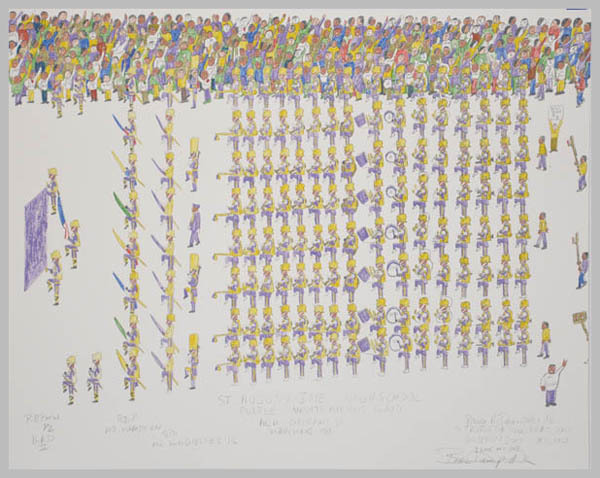 Flat, patterned formations, reminiscent of Egyptian hieroglyphs, communicate a spiritual component he also notes as a part of marching band communities. Davenport Jr. currently lives and works in New Orleans’ Ninth Ward district.